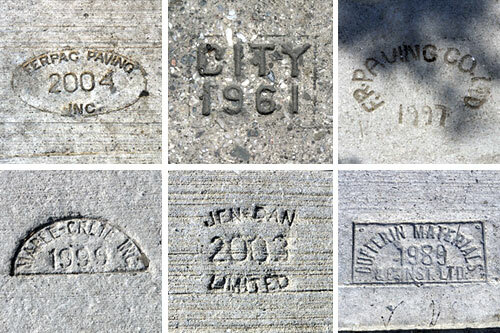 The sidewalks of Toronto are littered with contractor stamps. They’re so common that we’ve stopped noticing them completely — but walk ten feet in any direction and you’ll stumble over two or three. However, at intersections where there are dozens of them, the stamps also act as little promotional advertisements for a given contractor. Are there other public works projects where workers are so visibly “signing” their work? Whomever paints lines on the road isn’t reversing their logo out of every fifth stripe. Contrast this with the sidewalks of New York where contractor stamps are virtually non-existent. Extra marks: Need to occupy kids or friends with OCD? Send them off to seek out the oldest and newest stamps on your block.